Enjoy downloading the After Midnight Full Moon Party Flyer Template! There are some times when the kids are allowed to stay up after dark, when curfew is forfeit and they go to bed far later than usual… but that is NOT tonight!! The moon will be full, the drinks will be poured and the children will be fast asleep! Throw a Full Moon party and make promotions a breeze by using the Full Moon Party Flyer Template! 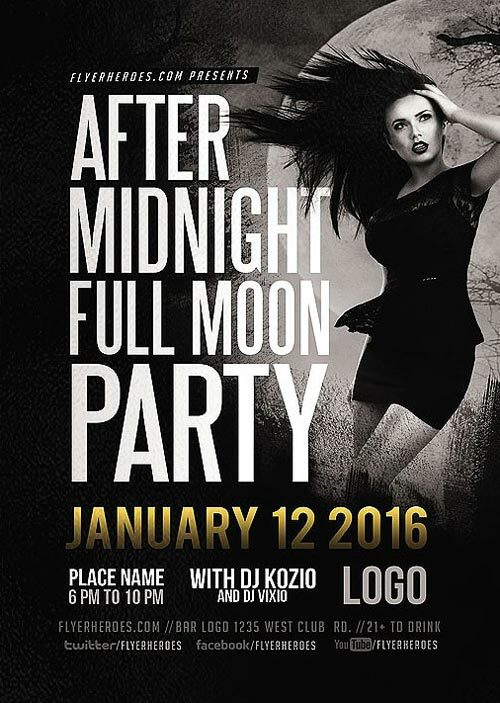 After Midnight Full Moon Party Flyer Template from FlyerHeroes are fully editable Photoshop PSDs. Once you have downloaded this template, using Adobe Photoshop CS4+ you can make use of this flyer design an unlimited number of times 100% royalty free. You are free to customize this design however you wish and use in both personal and commercial projects without ever crediting FlyerHeroes.